“Distancing ourselves clearly from self-immolation as a political method is not a betrayal of our sacrificing Tibetan brothers and sisters. Not distancing ourselves means approval and indirect encouragement of a method that is neither humanly sustainable nor politically effective. Self-immolation is not okay even as the ultimate resort”. 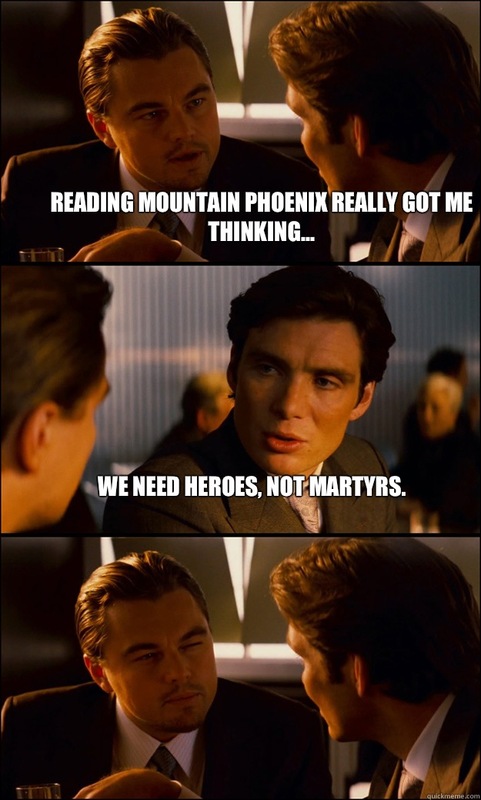 Now I don’t know who Mountain Phoenix is. I’ve only just begun reading her blog this past year, and this week there was a new post published that was unlike anything I’ve read this year regarding the self-immolations in Tibet. The more I read, the more I thought man, this Phoenix is ON POINT. It’s a piece many may disagree with, and I myself am not 100% down with every part of this post, but she does put into words what I had hoped someone would do for months. Phoenix explains straight up why she believes self-immolations are not a sustainable or politically effective form of protest. Instead she calls for a movement similar to Lhakar that is more about living and planning strategically for the future rather than memorializing the growing number of martyrs each month. We begin with ourselves, extend it to our families, which then flows into our communities. It’s “Lhakar” bottom up, magnified by seven days a week, extrapolated to 365 days of the year, for the rest of our lives. And while each of us individually goes about accomplishing these tasks, we draw on our inner strength and confidence sharing that with our family and our community. With all my prayers for the deceased and those left wounded, I fail to see them as heroes. I can follow they believed if only something dramatic would be done it could improve the situation. But a hero personifies an ideal and works to fulfill that in the real world, someone who leads by example and whose actions bring change, a person we can strive to emulate. Politically motivated suicide victims cannot be role models for our society no matter how noble and selfless the goal. These deaths are tragic and the victims’ families deserve all our sympathies, but begging your pardon, they are not “heroes”. How do you figure someone a hero? A martyr? What are the qualifying factors? In the “Self Immolation Fact Sheet” published by the International Campaign for Tibet, it only lists 35 Tibetans, all from Tibet except the sheet’s title implies this is a complete list. I guess they don’t count the self-immolation in Delhi by 27 year old Jamphel Yeshi during the visit of Chinese Premier Hu Jintao last month, a boy with burns over 90% of his body who later died and whose body was brought back to Dharamsala for a funeral that was attended by thousands. Or 26 year old, Dhondup Puntsok, who decided to confirm his own dedication to Tibetan Freedom by taking his life and jumping off Horwah Bridge in Kolkata, only to have this body fished out of the Ganges the next morning and identified by his mother. He was wearing a “Free Tibet” T-shirt. He said he was inspired by Jamphel Yeshi’s self-immolation in Delhi. Death has so many variables. So many ways to die, and when I think about people who commit suicide or take part in actions that have a great likelihood of resulting in their own deaths, I wonder why and how some people choose to do it. What was the reason, and what did they want us to know. How can we make an absolute decision that any of these Tibetans’ actions were not of a heroic nature? When I think about the use of self-immolation as a strategic form of protest, I ask myself, what were the goals of the people who have self-immolated? The ones that we do know about, the ones that we have actual statements, messages or audio recording from are strategically planned with the goal to immolate and have their statements heard. Even though they may lose their lives, their goal was not to die. Rather, their goal was to make a political statement through their testimony but overwhelmingly through the very act of self-immolation and were willing to give up their lives as a result. After Puntsok’s death there were two main articles I saw that were being circulated online. In both, Puntsok was referred to as a martyr several times. I wonder why Tibetans never grow tired of this word. Every time I see it there is this deeply unsettling feeling that rises within me. It makes me think we are using the wrong word. I think that Phoenix has a point in saying that we are too quick to call everyone who self-immolates a “hero”. For a while I had been wondering if there was even a difference in the Tibetan words for “hero” and “martyr” because as of late people have been using them interchangeably. And if there is a difference, do we distinguish between the two enough?? It seems like in the past two years alone, the way we use those words all carry along with the same connotation, especially between Tibetans who self-immolate and Tibetans who resist in a heroic way. I do think there is a difference between a martyr and a hero, and personally, I think we need more heroes. Here is a link to the full post, Rising From the Ashes, by Mountain Phoenix Over Tibet. OMG You and MPheonix are now really getting on my nerves. I have just read MP’s post and gave up halfway through. Thought LD might have some interesting stuff, but come across your views on self-immolations. I truly feel now I should write something that will DISPEL (lol) the ignorance of confusion that lie within people like You n MP. There is one fundamental thing that makes us see self-immolations differently. You and MP think these people who gave up their lives are not martyrs but rather “emotionally driven/confused people”. If you read their testaments, it is clear that they carried out their acts with full sense and sensibility. There was no sign of confusion. In fact, they are rather rational, confident and courageous. Please don’t compare these acts of self-immolations to Lhakar for it runs the comparing Milarepa to ordinary Geshes. With all my due respect to Phoenix I chose to differ the idea and concept of self immolation from that of yours.Thoughts of self-immolation and suicide to escape from ones own misery and weakness is certainly different from that of the self-immolation by our numerous conscientious courageous Tibetan brothers and sisters both inside and outside of Tibet whose sole intentions were to inform the deaf ears and dumb mouths of the world communities who only seem to enjoy entertaining those sorts of visuals which our heroes took them in as the only way to draw their attention to our over-looked cause;and Tibetan problems have received attention we never saw in the past fifty some years. Therefore those self immolators are heroes without a taint of doubts in my mind.Their sacrifice of their lives with such noble thoughts,deeds and intention to be reduced to shire suicide is the most ridiculous thing any one Tibetan could ever think of, if you are a Tibetan.Having said that,I do not entertain the idea of any shape or form to end their lives in this way by a long shot.We all can do more being alive.But,I have tremendous respect for those who gave up their lives for the greater cause of Tibet and the Tibetans.They did what they knew best for our cause.So who are we to misjudge them? No two individuals ever think alike.Otherwise; we would either be all ” Dalai Lamas, or Mao Tsetungs”. Take your pick. Your questions like why and how they chose to die made little or no sense to me at all.The whole world seem to have understood if not all, but the most of it. What do you mean? Obviously you are either clueless or you are trying to wake up sleeping Tibetans to do more.In which case I am with you. You are all free to express your opinions in however many ways you want; but make sure; those that sacrificed their lives hoping as they died something good will come out of their sacrifices don’t seem like nothing. ” THEY ARE OUR HEROES AND TIBETAN HISTORY WILL JUDGE THEM KINDLY AND RESPECTFULLY”;believe you me. i think its very hard for some people to fathom such selfless acts so they assume it be out of impulse or over emotion etc. in fact these sefless acts are not only very brave but these individuals have acted out of great concern and kindness for the tibetan people. i’m sure some of them have contemplated and meditated upon their decisions and having a clear handle on their minds have taken this step.As lama sopa said he was offering his body to dispel the darkness around us. Yes, there is so much darkness all around and we go about ignorantly accepting it as the norm. some of us have been conditioned by our half baked knowledge of buddhism and some of us have been influenced by western sensitivites and norms.